Unless you are lucky enough to regularly fly First or Business Class, chances are high that you have at some point experienced some pretty ordinary and disappointing air-line food. On top of this, the food outlets at most major airport terminals nowadays are like walking through a Westfield Food Court, a place I usually keep my distance from. However when you have to catch a flight somewhere there’s no choice but to amble to the departure gate, wading past all the red and yellow big M’s, Hungry Jacks and Krispy Kreme counters. There are some healthier options like Sumo Salad, Sushi Train and Boost, but at $15 for a Mango Tango and a small fruit salad? I’ve already paid for travel or parking costs to Sydney Airport, hidden overweight baggage fees at check-in and a weak $4.50 double shot flat-white while waiting for the other band members to arrive. The wallet has already had a decent work-out. I feel some-what comforted by the fact that today I am getting on a Qantaslink flight from Tamworth to Sydney after doing a gig with The Bushwackers there last night, so I will be given food rather than having to purchase something like a triangular plastic packaged stale egg and lettuce sandwich on Virgin, Jetstar or (gulp) Tiger Airways. Their in-flight menus say they are fresh, but I think this means ‘freshly thawed’ not ‘freshly made’. If you are a highly organised person you’d prepare and take your own food. But if I have an interstate gig, before leaving home am more concerned with making sure I have all instruments and stage gear needed, not what sort of nourishment for flight duration. I do however carry a bag of almonds with me always. Almonds in my handbag have warded off hunger pains in the face of dire food options on many travel occasions. 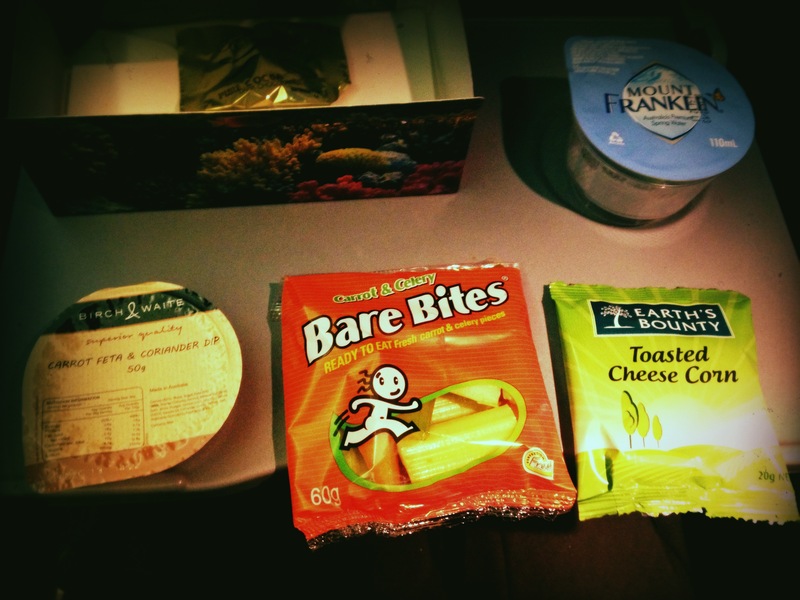 The economy class food served by Qantas has gone through many changes over the years. Depending on where you are flying to domestically and at what time of the day determines the quantity and quality of what you’ll receive on that flight. 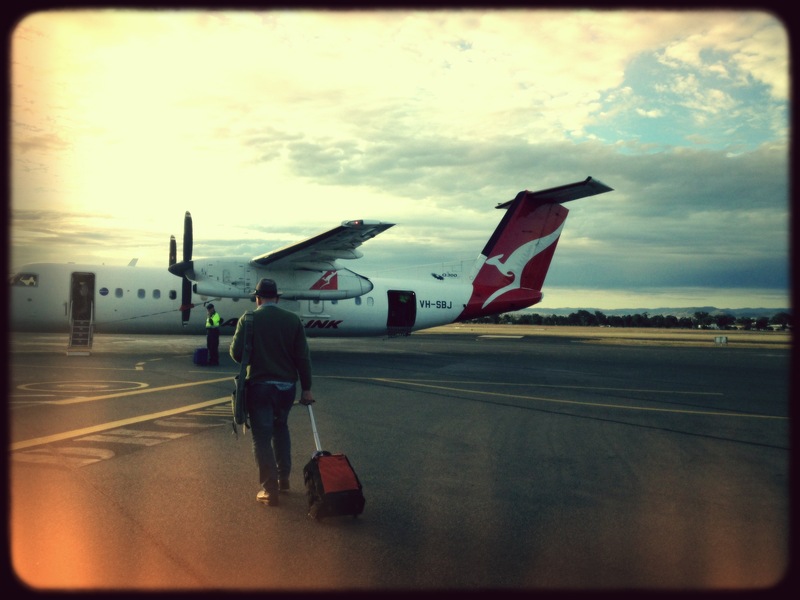 Tamworth to Sydney is a short flight, so it won’t be a three course meal (entree, main and dessert on one single tray). Today, it’s the Mystery Box. It looks cute, a nice picture of what resembles the Great Barrier Reef which is probably meant to relax you if you are a nervous flyer, like the sort of thing you see in dentist waiting rooms. I’m wary of food in boxes and packets, but what’s this? Carrot and celery pieces? That’s a good start. I give the Carrot Feta and Coriander Dip a try and it’s a bit of a let down, too sweet and not much trace of feta or coriander. That’s fine as am happy with vegetables on their own. (I just googled the dip to find out some more information and a link to Neil Perry and the Qantas Epicure Event held on Lizard Island came up. 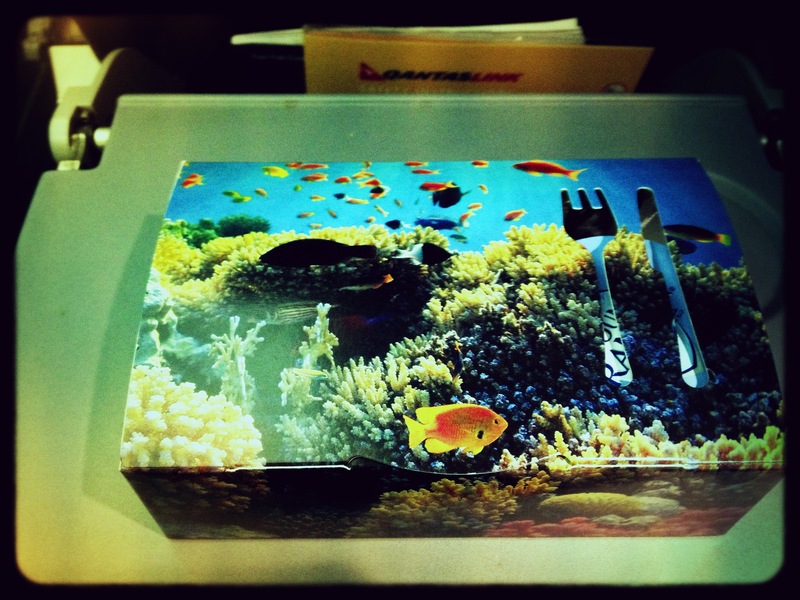 This probably explains the picture of the reef on the box). I’m going nowhere near that Toasted Cheese Corn, need I say more?